With our JR (Japan Rail) Pass we can use the japanese railway system for one week without any additional cost. 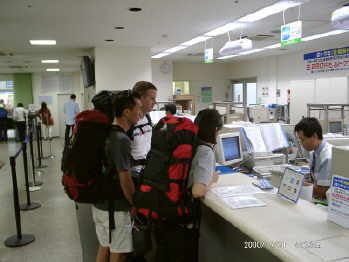 In the JR Travel Center we booked our trip to Hiroshima. After 5 very comfortable hours in the Shinkansen bullet train we arrived quite relaxed in Hiroshima. Right upon arrival we went to the travel information in the train station and booked our accomodation for the night. 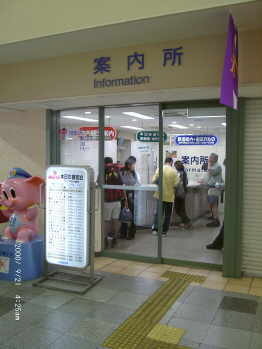 The very helpful employees of these information centers in Japan try very hard to please every customer even if language might be a problem sometimes. 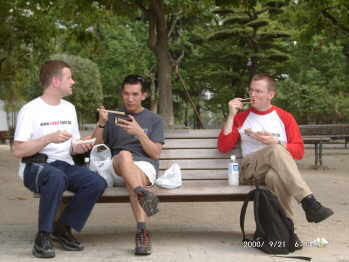 A local supermarket was where we bought lunch-boxes for a picnic in the Peace Park. You would be amazed to see the vast variety of ready made japanese dishes covering many styles of japanese food (ranging from Sashimi to Soba and Tempura).. 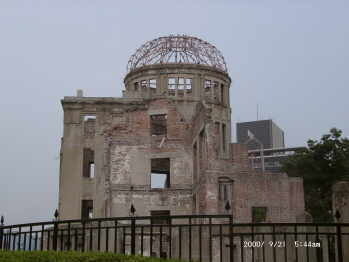 The Atomic Bomb Dome and the Peace Memorial Museum are well worth a visit while being in Hiroshima. Waiting times for the next tram were used very efficiently. Did you recognize the Japan-Tour Team T-Shirt ??? 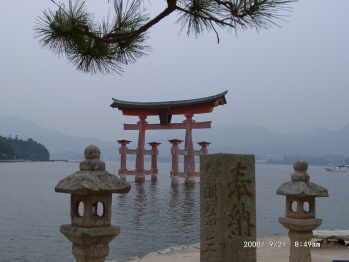 We used the Rail Pass to go via train and ferry boat to the lovely island Miyajima in Hiroshima Bay. 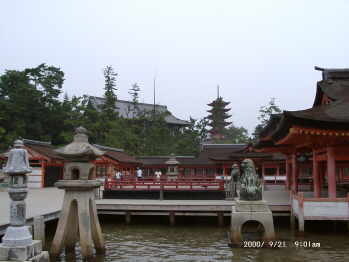 You can admire the big entrance gate `Otorii Gate` which is surrounded by the shallow water in front of the temple already from the ferry boat. It is recognized as part of the world heritage by UNESCO. The Gate forms the entrance to the Itsukushima Shrine, which is said to be one of the three most beautiful places in Japan. Here we learned that after making a small donation you have to clap your hands twice in front of Shinto-shrines in order to make a wish. ATTENTION: At the buddhist temple located just a couple of yards from the shrine you are NOT supposed to clap your hands! After our day trip involving quite a lot of walking in the hot and very humid climate we looked for a good but reasonably priced small restaurant. 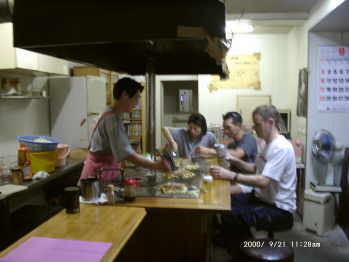 Luckily we found the restaurant of Ms Nobumoto who served us the local speciality `Okonomiyaki`. This is kind of a Hiroshima-style omelette consisting of a lot of vegatables, eggs and meat with a yummy sauce. For abut 450 Yen (some 4 US$) per person we had plenty of good food and finished our first day `in style`. 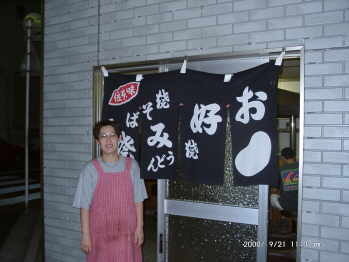 We liked the `at-home` atmosphere and the friendliness of Ms Nobumoto very much. Want to give it a try, too? 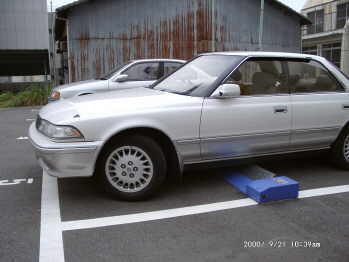 1) What is the blue object under the car ?